Dr. Suwanchinda, founder and director of Medisci Biointegrative & Anti-Aging Center in Bangkok and key opinion leader regarding laser and non-laser devices for skin rejuvenation on Asian skin, will speak about her experience with Hybrid Energy Technology. Dr. Atchima Suwanchinda renown dermatologist and founder and medical director of Medisci , Biointegrative Antiaging and Cosmetic Medical Center will lecture about Hybrid Energy Technology at the upcoming International Congress in Aesthetic Dermatology in Bangkok. The ICAD congress will take place January 24-26, 2013. Pollogen will be exhibiting at booth B14, B15. Dr. Atchima - a highly-experienced laser surgeon using ablative Erbium YAG laser resurfacing on Asian skin and key opinion leader for many laser and non-laser devices for skin rejuvenation on Asian skin, will present her experience with Hybrid Energy and offer live demonstrations of this clinically proven technology. Hybrid Energy Technology, a new emerging advancement in fractional radio frequency technology was specifically developed for wrinkle reduction, acne scars improvement treatment and skin volumizing without surgery, virtually no pain or downtime and minimal visible response on the skin’s surface. The key advantage of Hybrid Energy (HE) Technology is the combination of Hot and Electrical Invisible Micro Ablation (IMA) which is administered via a disposable tip comprised of an array of micro pins. Hot IMA facilitates smooth and painless penetration of the micro pins to target the mid dermis. Electrical IMA then selectively affects the target area using safe non-thermal energy. This creates micro-wounds in the dermis and triggers the body’s natural healing response mechanism in a safe process, with none to minimal pain and no down time. As a result, while epidermal visible response is minimized, a significant effect is generated in the Dermis that delivers Auto-production of Hyaluronic Acid, Collagen Regeneration and Elastin Growth. Hybrid Energy Technology is available through Surgen- a cutting-edge platform which also integrates TriFractional Technology - an advanced anti-aging radio frequency procedure that enables effective fractional skin resurfacing and is suitable for enhancing the Hybrid Energy treatment effect for skin complexion improvement in case of epidermal imperfections. 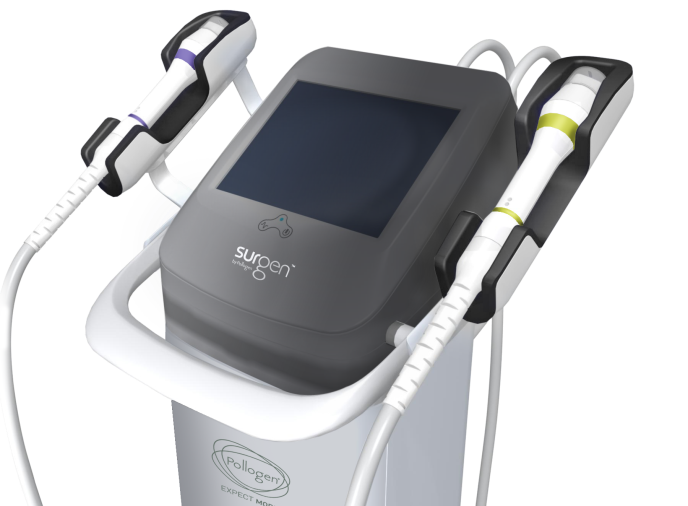 The Surgen platform has a user friendly touch screen with pre-programmed but adjustable parameters for each treatment type. “Due to the fact that Hybrid Energy technology treatments result in a relatively major dermal remodeling effect while minimizing visible epidermal effect, this treatment modality is very suitable for delicate and sensitive skin types which are prone to pigmentation changes,” Dr. Atchima stated. Pollogen Ltd. is a global leader in the medical aesthetic market, providing professionals in over 60 countries with a wide variety of advanced aesthetic solutions to best serve their customers. Pollogen is the developer and manufacturer of four revolutionary technologies under the industry premier brand names Hybrid Energy™,TriPollar®, TriLipo® and TriFractional™ and offers a full line of clinically-proven, safe and effective, non-invasive anti-aging facial and body contouring treatment platforms for a range of aesthetic applications including circumference reduction, cellulite reduction and skin tightening. For more information, visit pollogen.com.